Hawaii is the most remote group of islands in the world. It lies in the middle of the Pacific Ocean and is 3, 700 kilometers away from California and even 6, 400 kilometers from Japan. The islands are up to 4, 200 m high so that you can find some of the highest mountains right there. The state Hawaii encloses 132 islands with reefs and sandbanks on a land area of 16, 637 square kilometers. Six of them can be visited and they have all their own character. Hawaii has about 1, 200, 000 inhabitants. There are eight main islands consisting of volcanic mass. The capital Honolulu lies on Oahu. One very special thing about Hawaii is the hot an humid climate because the main islands are completely in the tropics. So it is ideal for traveling the whole year. The temperatures are always between 24 C and 27 C. But sometimes you can even find snow on the top of the mountains. The water is always warm, too. It is the whole year at 22 C so that you can swim whenever you want. 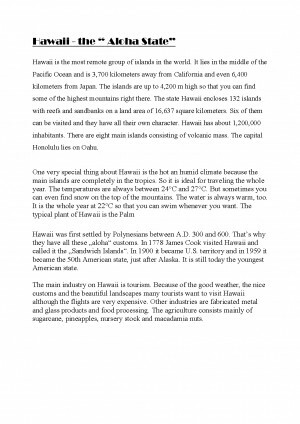 The typical plant of Hawaii is the Palm Hawaii was first settled by Polynesians between A. D. 300 and 600. That s why they have all these aloha customs. In 1778 James Cook visited Hawaii and called it the Sandwich Islands. In 1900 it became U. S. territory and in 1959 it became the 50th American state, just after Alaska. It is still today the youngest American state. Descărcarea referatului cu titlul "Hawaii Aloha State" este gratuită. Completezi informațiile din formularul de comandă și imediat după aceea vei primi prin email link-ul de descărcare.